people, data & processes together. Discover how Ivant helped companies transform their service delivery models & be ahead of the competition. 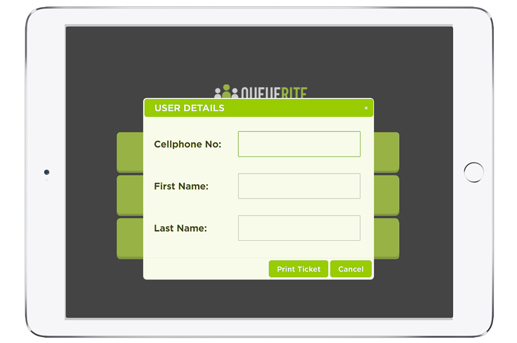 Our company developed the QueueRite (www.queuerite.com) customer queue management system. 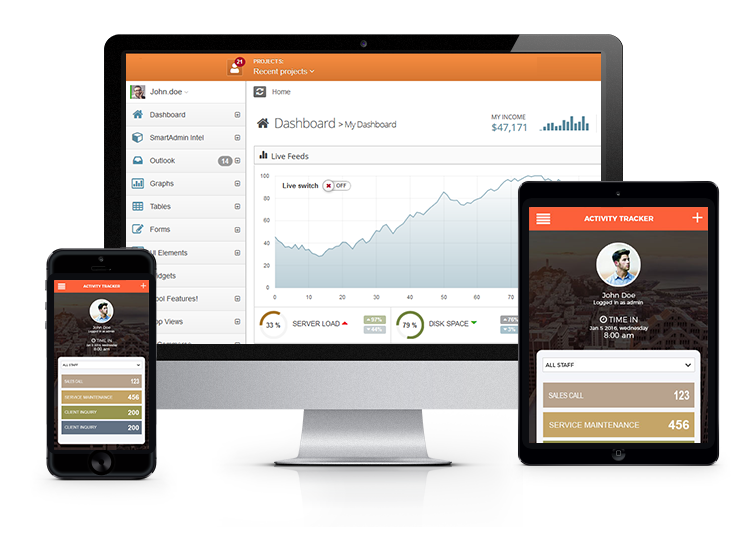 The software features customizable workflow management, custom TV display screens, SMS messaging, reports and analytics. Currently in use by a number of leading businesses that provides to provide a better customer experience, such as banks, airlines, payment centers, schools, government offices, etc. This is a browser based customer queue management software solution that uses off-the-shelf PC equipments, proving very cost efficient for the clients. 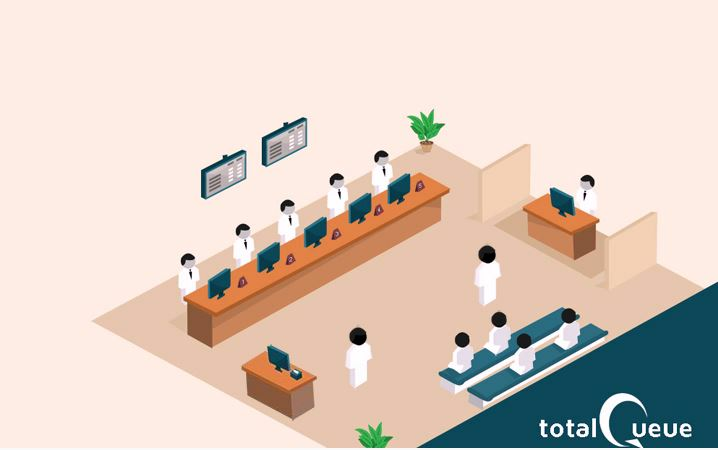 We developed this customer queue management software as a commercial grade software ready to be downloaded from the website http://www.totalqueue.com/.Our team designed the user-friendly configuration and the set up process,with the aim of making installation and deployment quick and easy for the users. The TotalQueue Software is available in 3 separate versions that differs in feature sets and in pricing: Basic Version, Standard Version and the Business Version. This software system best suits businesses with IT staff that can do the queue system hardware setup and make the interconnections work between the various components of the queue system. Seeing that modern IT solutions would greatly benefit a company that has an expanding network of corporate clients, Ivant Technologies and Business Solutions offered its web applications expertise to Frosch Rewards and Incentives. For this project, Ivant took charge of designing an online rewards and incentives program for Frosch. 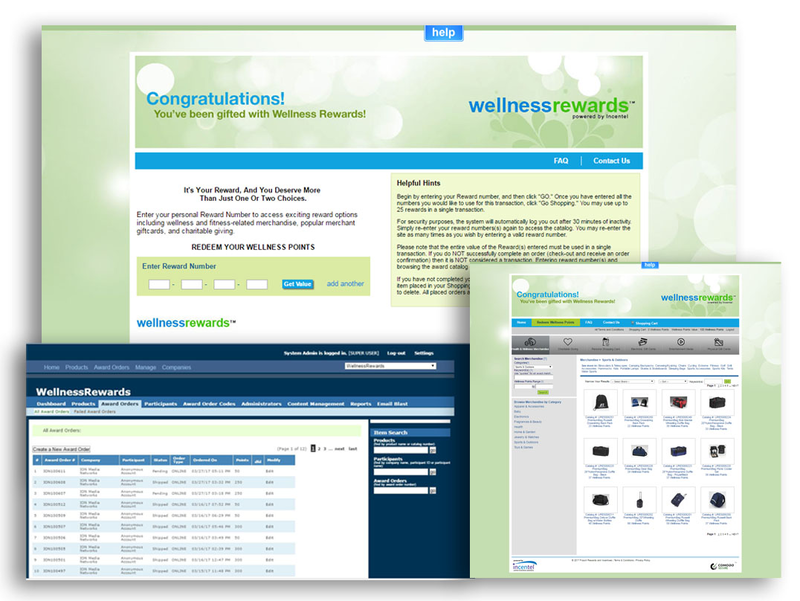 Nothing beats receiving rewards and incentives to motivate employees. Due to the individual differences of employees, though, it is natural that the said rewards and incentives are customized according to the preferences of those who will vie for it. Would new gadgets motivate employees more? Or maybe a complete travel package would do the trick. As these questions are answered, the next step for Frosch is to manage the particular rewards and incentives for their client’s staff. For these functions, Frosch relies on Incentel, the web-based application that Ivant developed for them. Incentel is an online rewards and incentives program. It is through this system that Frosch offers online catalogues to corporate clients. Once the client has chosen a catalogue, it has the option to oversee and administer as a program administrator. This way, the client will be more involved in the rewards and incentives received by their employees. On the part of the employees, this system poses a great advantage because they can do a real-time checking of the points they have earned. Updates are also made instant through this system. Meanwhile, debits for the rewards are automatically deducted upon the direction of the employee who is vying for an incentive or reward. This translates to a speedier way for employees to earn points and to redeem them; a more hands-on involvement for the company as it gives rewards and incentives to its employees and of course, a more convenient way for Frosch to manage their clients’ rewards and incentives program. Accessibility, reliability and maximum functionality defines Ivant’s online IT solution for Frosch Rewards and Incentives. Supporting companies that want to be at par with the contemporary IT development in the local healthcare industry, Ivant Technologies rendered a customized web application services to Hi-Precision Diagnostics. 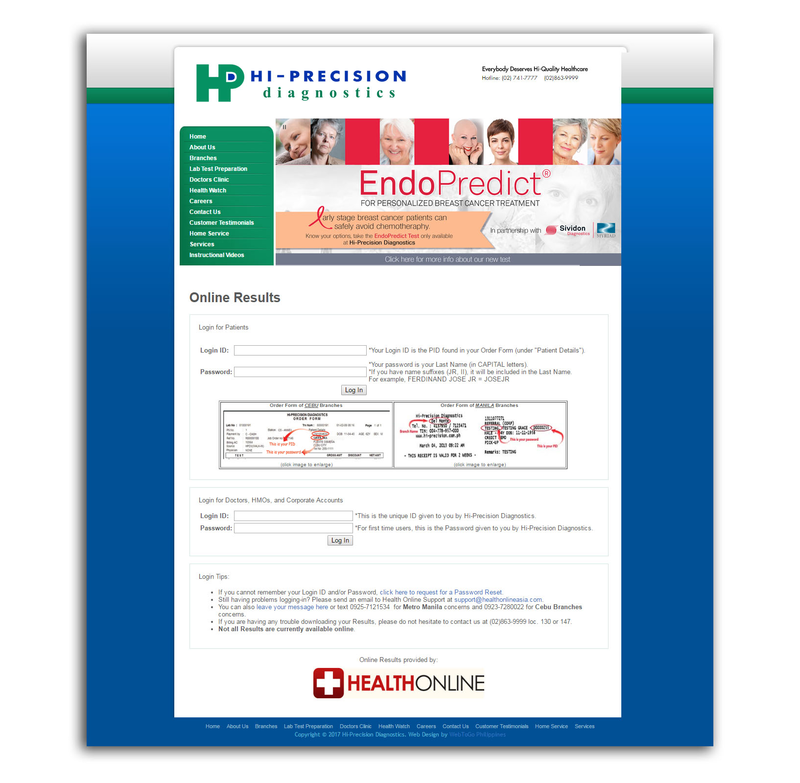 This partnership made Hi-Precision Diagnostics the first in the country to offer online clinical results to its customers. After taking a specified clinical exam, customers are usually instructed to return after a few days to get the results of their tests. On top of worrying over the outcome of the clinical test, customers usually have to bend over backwards to make time for getting the results of the said test. A missed day at work, a missed class, a missed day out with friends or family members. This is what a customer constantly deals with, just to make it to a diagnostic clinic on time. But with the new system provided by Ivant Technologies for Hi-Precision Diagnostics, there would be none of these. Getting clinical results will be as easy as turning on the computer and clicking the mouse several times. The online results services that are offered by Hi-Precision to its customers is a user-friendly system that was specifically designed to make accessibility and reliability within the customers’ reach. After paying for a particular clinical test, the customer will be provided with a log in ID. This code, found on the receipt, will enable the customer to get quick clinical results online, thereby saving time and cutting costs as well. A modern innovation that speeds up the process of getting clinical results – a solution designed by Ivant Technologies. 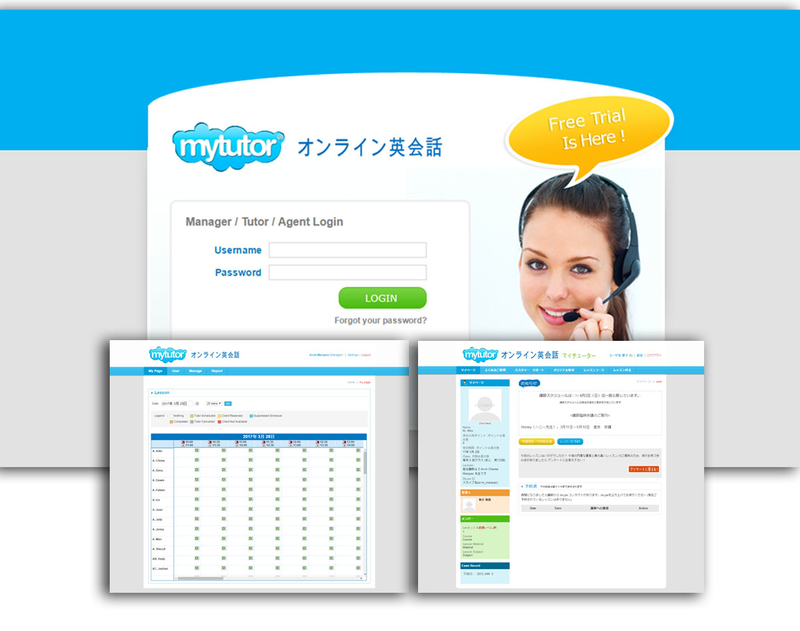 MyTutor is one of the companies that address the demand for English language proficiency among the Japanese. With the influx of their clients, MyTutor anticipates that certain glitches in scheduling online classes may arise. Before any of these could happen, MyTutor availed the comprehensive IT solutions of Ivant Technologies and Business Solutions. MyTutor provides online English tutorial to their students. Because the students who are availing their English classes are increasing, it is necessary for them to use an online system to make the scheduling of students’ lessons more organized. Although the company already had an existing online scheduling system, the new software program developed by Ivant Technologies was patterned after the specific instructions of the owners of MyTutor. The concept was to create two online scheduling systems; one for the MyTutor teachers and administrators and the other is for the students. These two designs work hand-in-hand in optimizing tutorial lessons’ schedules for those who are in-charge of the lesson and for those who want to attend the lessons virtually. Through the said system, students can easily set schedules based on their availability. The approval of the targeted schedule will be based on the availability of instructors. Aside from the online scheduling of lessons, this system was also created to rate both the instructors and the students, provide lesson summary reports, post messages and monitor users’ points. Points are used in place of cash. An online system for scheduling English classes is a modern innovation exclusively designed by Ivant Technologies. Due to the large-scale energy projects of the Energy Development Corporation (EDC), the company is challenged when it comes to creating more detailed well designs. This problem was solved when Ivant Technologies created a software program for the well designs of EDC. EDC is the country’s industry leader in geothermal and renewable energy. This company is involved in both local and international renewable energy initiatives. It takes charge of more than 60% of the total geothermal capacity in the Philippines to date. The web-based application designed by Ivant Technologies for EDC, called the Geo Well Design Monitoring System, is a replacement for the previous system used by EDC. Ivant's improved software program enables the capturing of 3D images on top of providing EDC with well designs that are systematically and methodically structured. With premier IT services from Ivant, research and development projects for renewable energy will be more focused and efficient. When it comes to cars, the brand Toyota always comes up. Indeed, Toyota Motor Corporation is a well-established name in car manufacturing and sales. With its large client base and reputable name, Ivant Technologies is proud to have created a production monitoring system for Toyota Motors – Philippines. To say that cars are a fixture in the main streets and highways of the Philippines is an understatement. Millions of Filipinos travel by cars because admittedly, riding your own vehicle has great advantages. With this scenario, imagine what Toyota constantly deals with – the manufacturing and production of large quantities of automotives for the Philippine market. This task was made easier and less susceptible to errors when Ivant Technologies created a software program for Toyota Motors Philippines. The function of Ivant’s software program is to keep an eye on Toyota’s car production and manufacturing process. It checks on the quality and quantity of the materials that will be used to enable Toyota to maintain the highest standards in the cars that they produce. In case the system finds something wrong with their car production materials, an alarm would immediately go off. Meanwhile, there are also added security and arrangement features that are made available through this real-time system. These include the scheduling of tasks, the listing of users and their logs and the retrieval of graphical data. A system that monitors production quality data from automated machineries is another remarkable software product created by Ivant Technologies. Ivant Technologies created the first help support system used today by Health Online. The Health Online Help support System is primarily used to provide customer service functions for the Health Online customers. It also serves as a system for internal communications within the Health Online group. The concept behind this system is very simple. Customers who need assistance from Health Online – ranging from the clinic schedule of doctors to the results of their laboratory exam and more – can file their requests from the Health Online website. Because the help support system is integrated unto the website, the Health Online representatives will receive the requests real-time. Upon receiving the request, the representatives would label each request as a single ticket. These tickets will be assigned to the Health Online representative who is most capable of settling the request. The system offers both auto assign and manual assign functionalities. This means that the Health Online representatives can choose among their group the best person to handle customer requests. They can have the tickets assigned manually or automatically. Finally, this system also offers an uncomplicated user interface. One look at it and you will understand how to operate the system, how to use its additional features and where to find the important tabs and tools. We developed an Employee Health Management software that is being used by the company's 30,000 + employees. The software is integrated with the company's Active Directory Federation Services (ADFS), providing a single sign-on and a seamless experience for the users. The web based software allows employees to schedule their preferred health check up schedules, and is fully integrated into the Laboratory Information System (LIS) of the various Health Clinics involved. Web services and HL7 were used in the data integration with the 3rd party systems.